Libya, as an African country, is attractive enough in terms of investments in the traffic termination. There is a high level of penetration of mobile communication, which is more than 155% and perfectly catches GSM signals. With a competent approach, a call termination business in this country can bring over $ 100 via one equipment channel. The largest GSM operator in Libya is Libyana, which has a subscriber base that consists of more than 6.2 million users (with a population of 6.4 million). The cost of the SIM-card Libyana is about 3.5 dollars. To buy it, foreigners need to provide proof of identity. One individual is allowed to register one SIM-card. For termination it is better to buy SIM-cards from street vendors as they do not require documents. Libyana offers only one prepaid package - Libyana Prepaid Services that allows you to make a local call for $0.04. The average rate in Libya ranges from $0.05 to $0.08 per minute. 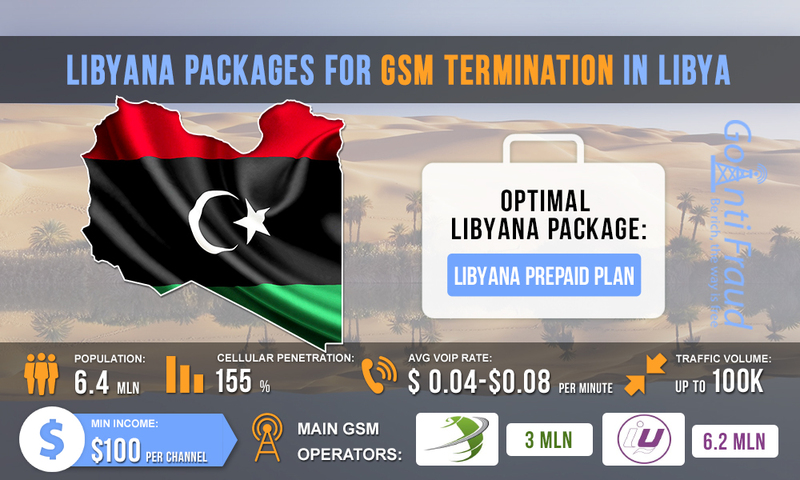 Using the Libyana prepaid package, you can make $100 from one VoIP channel, on average. To make the voice termination business bring you the expected profit, it is necessary to ensure the simulation of human behavior in GSM networks. Connect to GoAntiFraud, and you will get access to a wide range of functions. Efficient tools have SIM-cards rotating migrating, as well as computerize the workflow and remotely control VoIP equipment.